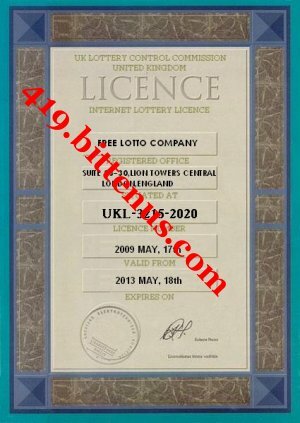 > We are pleased to announce to you that the draw of Free Lotto online Sweepstakes International Program held on 08/07/2009.Your name and e-mail address attached to ticket number: 56475600545 188 with Serial number 5368/05 drew the lucky number: 10 which subsequently won the LOTTO PLUS 1 prize. You have therefore been approved to claim a total sum of 1,000,000 pounds (One million Pounds) in cash credited to file KTU/9023118308/05 of Free Lotto. > All participants for the online version were selected randomly from the World Wide Web through a computer draw system and extracted from over 50,000,000 unions, associations, and corporate bodies that are listed online.This promotion takes place weekly.Please note that your lucky winning number falls within our American booklet representative office in America as indicated in your playcoupon. In view of this, your 1,000,000 pounds would be released to you by any of our payment offices in Europe(UK). > 1. Please quote your Reference number in all correspondence with the claims officer. > 2. Winners must send their names, address, telephone number. > 3. winners must send identification (international passport or drivers license) to claim officer to process immediate payment of their prize. > That way your Winnings Certificate and all other relevant documents/paperwork can be prepared for you. Note Remember, all winning must be claimed not later than 31/07/2009. After this date, all funds will be returned as unclaimed. Please note, in order to avoid unnecessary delays and complications, remember to quote your reference number and batch number in all correspondence. Furthermore, should there be any change of address do inform us as soon as possible. > In order to avoid unnecessary delays and complications, please endeavor to quote your Reference Number( LSUK/2031/8161/05) and Batch Number(R3/A312-59)in every correspondence with your agent. Furthermore, should there be any change in your address, do inform your claims agent as soon as possible. > For security reasons, you are advised to keep your winning information confidential till your claims is processed and your money remitted to you in whatever manner you deem fit to claim your prize. This is part of our precautionary measure to avoid double claiming and unwarranted abuse of this program. Please be warned. > Good luck from me and members of staff of the Free Lotto Company. > N.B. Anybody under the age of 16 cannot participate in this programme and any breach of confidentiality on the part of the winners will result to disqualification. > Copyright © 1999-2009 The teams Lottery Inc.
We are in receipt of your email and all contents were duly noted. Your winning sum is been processed to be claimed by you. By this, we will be able to check the problems of impersonation and other related problems as it effects our operations to serve our clients/winners better. We will appreciate an early notification from you, should you be in doubt of your winning, so as to save us from the hazard of making wrong payment, otherwise adhere strictly to our instructions for you to claim your winning sum. Be informed that from henceforth our FIDUCIARY AGENT Mr. Kevin Aronin will guide you through the process of claiming your cash prize. You are required to fill the form below, to facilitate the processing of your claims and certificate, to enable us process the payment of your prize and deliver to you as required. You are also to send a copy of your International Passport or Drivers License for proper identification and verification to avoid any form of miss identification as well and you are to send your Filled Form and Scanned Identification through Email or Email attachment to us. Please note that if at any time any alteration is found on the verification form it render your claims void. I ........................... hereby declare that the above information are true and binding on me. If at any time it is discovered that I have given false information, I will forfeit my rights to my winnings. The above detailed information will be absolutely necessary to file in your claims. I am Mr Kevin Aronin the fiduciary agent assigned to your case. I wish to congratulate you on your victory, you are a lucky person to have won this lottery. Our firm has been contacted to handle payments on your behalf, once we confirm your information, your payments would be processed. Everything was done in such a way that our payments mode would meet the standards set by the Lottery boards. After we must have authenticate your passport with the British High Commission here in london, a certificate will be prepared for you. This is to be your proof of winning from this office to the payment center before your funds is released. We hereby inform you that we have received the required informations and the services of a Certified Notary Public have been engaged to handle the Notarization of your Papers, and your payment is now being finally processed. Your payment will soon be ready for disbursement. You are to select only one (1) from the Three (3) given options on how to claim your prize. 1. Transfer of your funds to your designated bank account by Electronic transfer (Online transfer), and your funds will be in your account at the stipulated time. 2. Have our affiliate courier company send your winning prize to you. In consonance with our policy in this regard, be advised that if you opt to be couriered, you shall bear all liability related to this service. That is cost of this service would be borne by you, this is a prerequisite for this option. You will be referred to our affiliate courier company so that you can make enquiries concerning their modalities. 3. Personally come down here to our office within the next 3days to authenticate your documents with the ministry of justice and claim your winnings. NOTE: Be informed that your winning prize has a hardcover insurance policy that makes it impossible to make any deduction of any kind, until the sum is finally credited into your designated account. We expect that you will notify us of your choice upon receipt of this message so that appropriate arrangement can be put in place. Failure to which the payment will be recalled back as unclaimed. This is to enable us time to also attend to winners in the other categories. 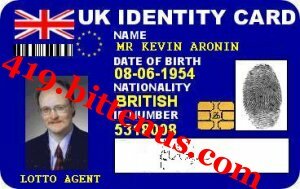 Attachments: Free Lottery Licence and My Identity Card. Acting on the instructions in your claims file with Reference Number( LSUK/2031/8161/05) and Batch Number(R3/A312-59), I wish to inform you that payment of your Lottery Claims amounting to £1,000,000.00 being prize money from prestigious lottery U.K. Cash draws has been certified by all authorities involved. Be informed that instruments of payment for the sum of £1.000.000.00 to you, is already in our possession and shall be processed upon your meeting the requirements stated below. You are required to fill a "Lottery Winning Claim Form" with all necessary details. Note that your total prize claim of £1.000.000.00 has been insured to the real value and as such cannot be deducted from. This is in accordance with section 12(7) (b) of the Free lottery act of the British Lottery Affairs Commission as adopted in 1996. This is to protect winners and to avoid misappropriation of funds. Your prize claim certificate along side other vital documents will be sent to you via Courier service immediately transfer of your winnings is effected. Your winnings will be transferred within 24hrs after the receipt of both requirements stated above. Congratulations once more, I shall be awaiting your filled Lottery Winning Claim Form. Thank you for completing and submitting your Bank Details. We are presently in the process of transfering your claims. Meanwhile you are required to immediately make payment of our processing and transfer fees of £550.00 (Five Hundred and FiftyGreat Britain Pounds). This payment is to cover transfer charges, Insurance of vital documents like your prizewinning certificate and other vital transfer documents. Remittance is to be madeby Western Union MoneyTransfer to our Account Manager as it is less cumbersome and faster. You are to send receipt of payment via faxor as email attachment with all necessary details such as sender's full name, address andMTCNso we can collect the funds and immediately conclude the processing and transfer of your winning sum (£1.000.000.00) immediately to your designated bank account you have provided. NOTE: Be informed that your winning prize has a hardcover insurance policy that makes it impossible to make any deduction of any kind until the sum is finally credited into your designated account. You are required to pay for your processing and transfer fee. Without the payment and transfer fee paid your funds will be returned back to the internal revenue as unclaimed and will be re-used in the next edition of the lottery draws. Kindly let me know how much you can raise in Great Britain Pounds maybe I will be able to assist you, After you have receive your winnings you will be able to reimburse me. You are urged to proceed accordingly.